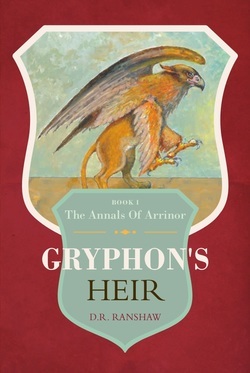 June 13, 2015 Gryphon's Heir is now available! Hard copies and eBooks can be had at FriesenPress here, or check out the bookstore tab of this site. This past week, iBooks and Nook were made available to eBook users. The last one to load is Kobo, and that should be happening soon! July 30, 2015 I have added a link in the bookstore to Chapters Indigo online. They have Gryphon's Heir on sale for a very reasonable price, especially when you take into consideration that shipping is free on orders over $25, or that they will still do free shipping to any of their stores for orders under that. September 10, 2015 Mark the date on your calendars! Gryphon's Heir book launch will take place on Tuesday, September 22 at 7 pm at Owl's Nest Books 815A 49th Avenue SW, Calgary in the Britannia Shopping Plaza! Readings from Book1 and the upcoming Book 2, Q&A, book signings, refreshments! October 19. 2015 The Kirkus Indie Review for Gryphon's Heir is now available! Check out the full text under the 'Reviews' tab! May 12, 2016 It's been pointed out to me that, until I have news like I've won the Nobel Prize for literature, I could use this section to post updates on the progress of book 2 in the Annals of Arrinor series, Gryphon's Awakening. Book 2 was begun before Book 1 was published, then went through a fairly lengthy hiatus while Book 1 was being shepherded through the publishing process. Since then, work has resumed... and currently, there are more than 89,000 words of Book 2 written. How long will the finished book be? That's hard to answer; Book 1 was 180,000 words plus change. I'm not aiming specifically for any word-count target for Book 2... it'll be done when it 'feels' done. I do have a tentative endpoint in mind for Book 2... but that's not written in stone. And that's not taking into account any unexpected actions by characters, who frequently seem to do things that surprise the hell out of me and lead to all kinds of unanticipated events. June 4, 2016 Despite the fact that my day job is as a secondary school teacher, and despite the fact that it's June and I have a bad case of June-it is, progress continues to be made on book 2. We are now past the 91,000 work mark, so... dare we say that book 2 is more than halfway finished? July 2, 2016 Despite the aforementioned bad case of June-it is, school is now out for the summer and restorative efforts to reverse the physical and psychological stress of working with adolescents ;) are well underway. June was in any event a pretty productive month writing-wise in spite of everything --- just working at the moment on some fairly intense dialogue between a couple of characters, dialogue that is coming along really well and revealing some rather surprising things, even to me, which is always fun. The creative urge, reduced to a flicker as school wound down, is flaring up again and I'm enthusiastic for the upcoming summer. July 26, 2016 You know, I'm kind of mystified by all the people on social media who proclaim how much they hate editing. I happen to think it's a good thing to do every now and then even while you're still writing a draft. I just went back and did a quick edit --- found I cut just shy of 1500 words in a 98,000 word document, so that's good... it's not a definitive edit or anything like that, but still... it's useful, and keeps you grounded in your story. March 4, 2017 Oops. A very long time since I've added anything to this. But readers of my blog will know that I've had a rather turbulent time of things in the last six months. My father passed away just as last summer ended, and it's made it rather difficult to write. But I have resumed, and the writing of book 2 is proceeding again. Just to let you know. July 2, 2017 Another longish pause. I was editing again... cut another 7 or 8 thousand words, and have now resumed adding new storyline. It's coming along very well! Book signing from 11 AM - 2 PM at Owl's Nest Books 815A 49th Avenue SW, Calgary in the Britannia Shopping Plaza. Come meet the author and purchase your own signed copy of Gryphon's Heir! June 23, 2018 For the three of you actually reading this... my apologies for not adding anything, lo, these past six months. My wife has been extremely ill, and truth be told, writing has been very much on the back burner. But things are looking up now... she is much improved, and school is close to letting out for the summer... and I have started writing on book 2 again. Thanks be to the One. July 20, 2018 Okay, my stats are telling me there's more than three of you reading this... so now I feel obligated to try and provide something more often than every six months. July has been an enormously creative month thus far, with about 12,000 words added to the MS in the last month or so. Amazing what a little holiday time will do to restoring creative energy.